After a combined effort from 8 bedouin, 5 people from SKGR, 3 people from Green and Away and a Dutch lady called Mirjam, we finished Gwoona dam last week. This dam will help bring water to many gardens down Wadi Gibal to Farsh Romana in the Sinai Mountains. 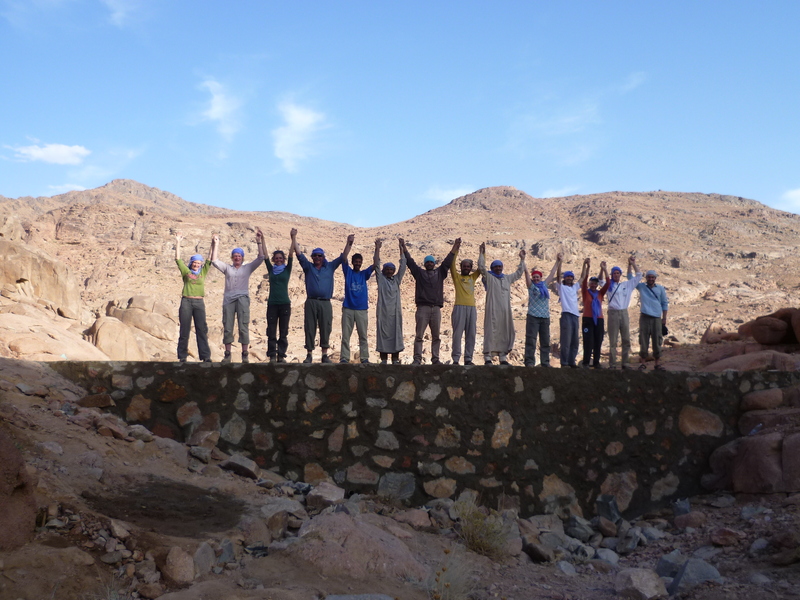 On 24 April, 7 participants from two organisations (SKGR – Self Knowledge, Global Responsibility http://www.selfknowledgeglobalresponsibility.org/ and Green and Away http://www.greenandaway.org/page.cfm?pageid=ga-home ) arrived in Sinai at the start of a journey to build Gwoona Dam. John Hill, Simon Gapper, Nick Ashford, Jeff Anderson, Marilyn Churchill, Rosa Butler, Diana Jarvis and Helen Cranston (journey leader) arrived at Nawamis for the first night. The second day we left for St Katherine’s and the mountains, and were joined by Mirjam Duymaer Van Twist from Nawamis. We had a wonderful trek up Wadi Tala, into Wadi Zuweitin for lunch, then up Wadi Gibal to Salem’s garden, our home for the next 5 nights. We were looked after by Eid and Mohamed with some visits from Hussein who had family matters to attend to in St Katherine’s. On the next day we joined the team of Bedouin builders, Saiyeed, Saiyeed, Mohamed, Salem, plus the cement boys, who had already been working for a week doing preparatory work. We found that they had had to dig down over a metre to get to bedrock so there was a lot of work needed to get the dam up to the finished height. Over the next three days we worked hard and the final dam was 15.70 m long and 2.70 m high. The dam was 1.20 m wide at the base and 1m wide at the top. It has a volume of 31sq m. The Bedouin estimate that the dam will hold 1700 cubic meters of water. The money for the dam was raised by the participants through friends and supporters. Such was the generosity of our sponsors that we exceeded the target of £2000 for the dam and raised enough funds for nearly ¾ of another dam. The day after we finished the dam, we had a slow trek to Farsh Romana. We were accompanied by Eid who was a brilliant guide and it was wonderful to have Mirjam with us as she was an excellent translator for the Bedouin stories that Eid was telling us. We heard about how a ruined chapel became a focus for teenagers to meet and decide if they wanted to marry. The girls would be herding the family’s goats over the mountains and often arranged to meet at the chapel to exchange news and see friends. The boys got to hear about the meetings and would find themselves in the same area on the same day! Although the boys and girls were not allowed to talk to each other they were able to flirt at a distance and look for a future husband or wife. This culminated in the drawing of the outline of their sandals on rocks. If the pairing was approved by the girls’ family, her father would signal his approval by drawing a circle around the two sandals. This led to discussions on love and marriage, conflicts in neighbouring countries and the need for world peace. Eid also told us about the history of the Jebeliya tribe, the meanings of names of landscape features, the herbs they use and of his sadness and concern that this entire heritage would be lost. None of his daughters have been up to the mountains gardens so they don’t know any of these stories and his sons only come up if they have work with tourists. It will only take a generation growing up in the towns for this history to fade, and with it the ability to live in the mountains and to keep the gardens going. Eid, Hussein, Salam and Saiyeed are all custodians of a way of life that is disappearing and along with it traditional wisdom and living in harmony with nature. What could change this would be a revival of the trekking holidays and more journeys which would bring more of the Jebeliya back up into the mountains as guides and camel providers. The dams and deepened wells are helping to keep the older generation connected to their heritage and make living in the mountains a possibility but the younger people need work in the mountains. The following day we trekked down the mountains to have an excellent lunch at Fansina and to indulge in some essential shopping for beaded bags. The minibus then took us out to Nawamis for the walk to Mattamir. At this point we said a sad goodbye to Mirjam who had worked so hard on the dam and as translator. We arrived to the magic of Mattamir just as the sun was going down. 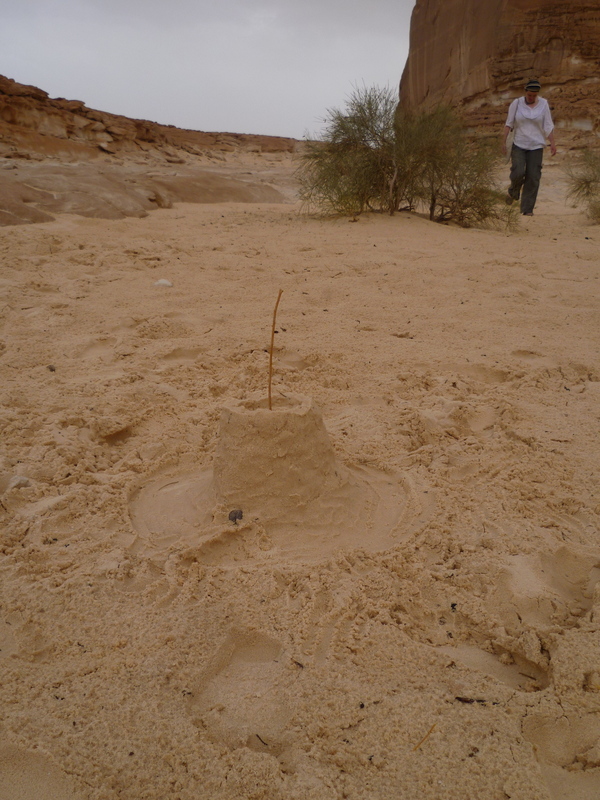 The following day we had the usual desert orientation walk and a chance to choose a place for our mini 24 hour retreat. sound of gushing water and saw a waterfall spewing off the top of a cliff below Gebal Mattamir. It seemed really incongruous to see so many puddles and the wet sand. It was even possible to make a sandcastle. Everything dried really quickly as the sun came out and went back to normal. To our great disappointment we heard from Mahmoud that there hadn’t been any rain at all in the mountains and that the new dam was still dry. For some the retreat was a welcome opportunity to have time in their busy lives to stop and do nothing for a day. For others it was an opportunity to reflect on the path their lives were taking and to make decisions about the way forward. We came together again on the last night for a delicious meal and to share our experiences over the previous 9 days. Our last day was spent walking and camel riding to Gebel Maharoon and Aduda dune then down to the jeeps for the journey back to Sharm El Sheik. The journey was very thought provoking and we learned a lot, some of it about the Bedouin cultural heritage and some things about ourselves. The contrast between our own lives back here in UK and Bedouin life helps put things in perspective and emphasise what is really important in life. Our impact on the Bedouin is huge but this is a reciprocal experience with everyone concerned being enriched – the journeys are definitely fulfilling all the aims of the Makhad Trust. We would like to thank all our sponsors for their generosity. The excess funds will be seed money for the next SKGR dam building trip scheduled for next spring. Look out for more details to follow. This entry was posted in Green and Away, Makhad Trust and tagged Bedouin, Camel trek, Desert, Desert Retreat, harmony with nature, inspiration, SKGR. Bookmark the permalink. Outstanding 🙂 It was a pleasure to read. Can’t wait to read the other posts. It is fine for you to quote some of my posts and I would appreciate it if you credit me and refer to my blog. I am interested to know what your website is, as you say it is similar to mine. If it is along the same lines then I could add links to it.